I was receiving the Notices of Electronic Filing but now I’m not. What could be the problem? If you changed firms or e-mail addresses and did not update your e-mail address in the CM/ECF system, your email notifications may not be going to the correct address. If the Court received “bounceback” or rejected emails and staff were unable to determine your new address, your email may have been deleted from the system. You must immediately update your account in the CM/ECF system. (See Local Rule 5-4.8.1.) For detailed instructions on how to update your contact information in CM/ECF, see the Court’s website at www.cacd.uscourts.gov/e-filing/maintaining-current-contact-information. In addition, if you are counsel of record in any cases currently pending in this district, you must file and serve Form G-06 (“Notice of Change of Attorney Business or Contact Information”) in each of your pending cases. Doing so will satisfy your notice obligation under Local Rule 83-2.4. Even if you have not recently changed firms, if you believe you are not receiving NEFs for court filings, check your profile to make sure it is up-to-date and correct. Who do I contact if I’m not receiving the NEFs from the Court? First, make sure your e-mail address is correct in the CM/ECF system. If it is not, log in to CM/ECF and update it immediately. 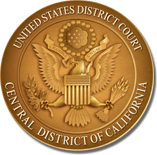 For detailed instructions on how to update your contact information in CM/ECF, see the Court’s website at www.cacd.uscourts.gov/e-filing/maintaining-current-contact-information. If your email address is correct in CM/ECF, check with your firm’s IT Department to be sure your email is not being forwarded to someone else, and confirm that "@cacd.uscourts.gov" is not blocked through your spam software. If none of these explains the problem, contact the CM/ECF Help Desk. They can help advise you if the issue is a Court-related problem. Otherwise, they may direct you to contact your firm’s System Administrator or IT Department. If you are a sole practitioner, you may need to contact your internet service provider (likely your cable or telephone company) or your email provider (Google, Yahoo, etc.). What happens if I change firms or email addresses and do not update the information on the CM/ECF system right away? Your email notifications will bounce back to the Court as non-deliverable as soon as the firm removes or deletes your old email account. When a bounced email is received from a user’s primary email address, Clerk’s Office staff will try to contact the attorney at the address listed in CM/ECF. If staff reach the attorney or the attorney’s assistant, they will work with the attorney to get the information updated on the CM/ECF system or help determine what the problem is so the attorney can properly receive Notices of Electronic Filing. If the attorney is no longer at the address on record in CM/ECF, the email – and all secondary addresses associated with that account – will be deleted, the attorney’s CM/ECF login will be disabled, and the attorney will not receive electronic service of any documents until an update is made. Note that, if a bounceback comes from a secondary email address on a CM/ECF User’s account, that email address will be deleted. Court staff do not follow-up on any secondary e-mail addresses. Attorneys, or their authorized staff, must log in to CM/ECF to make any necessary updates to secondary e-mail addresses. Which internet browsers does the Court currently support? Internet Explorer 6.0 or higher, Mozilla Firefox 1.5 or higher. Netscape Navigator (any version) is not supported. Who do I contact for questions regarding software compatibility? Your firm or company's System Administrator. Who do I contact for e-mail attachment questions? How do I redo an edit command? Some applications also have a Redo option, which "undoes the undo". How do I cut, copy and paste? Copying is the act of making a duplicate. Cutting is the act of removing something and placing it in another location (Deleting is the act of removing something entirely). Cutting sometimes works like deleting. Pasting is the act of placing anything that has been cut or copied into a new location. There are many ways to copy or cut, and paste, but all of them involve highlighting what you want to copy or cut first. For a file, simply clicking on the file once will highlight it. For text, position your cursor at the beginning of the text you want to highlight, hold the left mouse button down and drag the cursor to the end of the text you want to highlight, then release the mouse button. A plug-in is a small add-on piece of software that extends the capabilities of your web browser ( IE: Microsoft Internet Explorer, Mozilla Firefox, etc.) A plug-in may, for example, enable you to view files written in a format other than HTML, the language used to create Internet web sites, or to listen to audio files or view videos. What is a "link" or "hyperlink"? A "link" or "hyperlink" is a shortcut to another website, web page or document. These are represented by a word, number or phrase usually underlined or becomes underlined when the mouse cursor hovers over it. Links to Hyperlinks can also be represented as a picture or an image. Either way their purpose is to allow you to navigate from one page or web site to another. How can I create a shortcut icon on my desk top that will take me directly to the CM/ECF system? With any browser, you simply drag the little image (usually shaped as a page) located on the left of the web address (https://ecf.cacd.uscourts.gov) and drop it on your desktop. Be sure to have your desktop visible prior to doing this. You might need to resize your web browser to allow you to see parts of your desktop. It is recommended that the Court’s CM/ECF website be a shortcut or bookmark as messages are posted periodically regarding new filing procedures, announcements and scheduled maintenance. If the E-Filing login page is bookmarked, you may miss these important messages. The Court encourages e-filers to continue to view the E-Filing section on the Court's Website for updates, new features, planned/unplanned outages, etc.